Nature is beautiful, and nature can be adorable. However, after all the cute animals videos we see, it’s important to remember that wild animals are wild. We have to always remember that nature can be scary, too. Some Canadian residents learned this lesson the hard way the other day when a sea lion got a little too close for comfort. It started off pretty innocently. A wild sea lion swam up to the dock of a marina. Some people started feeding it bread crumbs. Then at minute 1:39 of this video it jumps and pulls this little girl in by her dress! 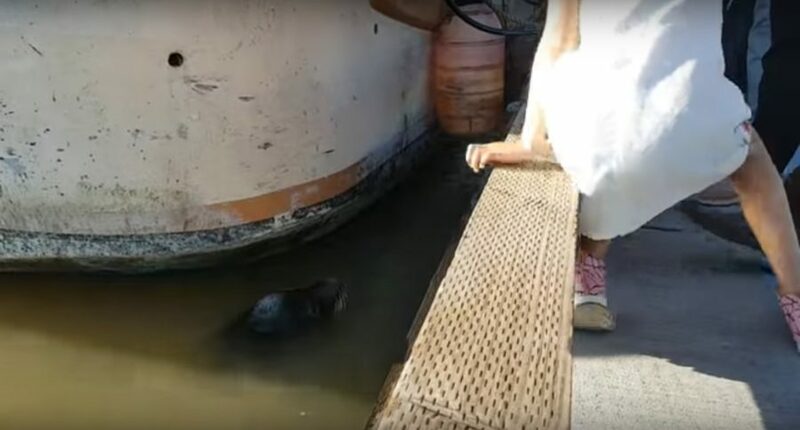 Luckily, an adult jumped in and saved her right away, and the sea lion left them alone after that. Neither the little girl or the sea lion were hurt. CBC consulted Andrew Trites, the director of UBC’s Marine Mammal Research Unit, on this video. Trites said that though this is scary, the sea lion probably just thought her dress was a piece of fish. This is clear since it swims off pretty quickly once it realizes its mistake. However, it just goes to show that we need to be super careful around wild animals. If you’re approached by an animal in the wild it is important to keep a respectful distance. Even if it appears to be friendly, you don’t want it to become comfortable around humans. If it gets used to being around people, it won’t be afraid of people. And we now how that can end. This fear is what keeps both us and the animals safe. So keep this in mind next time you’re interacting with nature! Even if an animal looks super cute, it doesn’t mean that it’s friendly or safe. You’re always better off keeping your distance when enjoying nature in its natural habitat. For our sake and theirs!